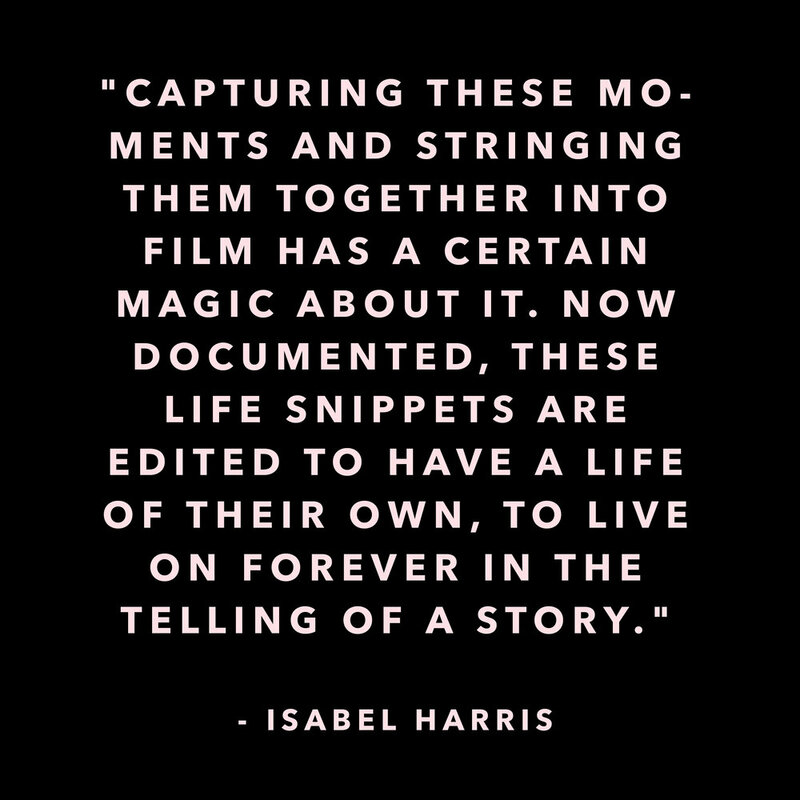 ISABEL HARRIS IS THE AMAZINGLY CREATIVE, FILM-MAKER, LADY-BOSS OF ALL I SEE IZ AND BESPOKE CINEMATOGRAPHY. I’m Isabel, of All I See Iz. I’m a filmmaker and I focus on making social media and web content for like-minded travel and family brands across the globe. I’m also a mama of two boys, ages four and one. Beyond work, and taking care of them, I really love to rock climb, read, and go on spontaneous adventures with the people I love. I initially started making videos as a way to document my husband and I in our early days of marriage. When I decided to start doing this professionally, I actually started out as a wedding filmmaker. That is where I really honed my skills and learned the how-to’s of owning your own business. As anyone who shoots wedding knows, the day only happens once, so you have to be on the ball with every. single. detail. Because of this, it really trained me up on how to shoot in any environment, no matter the pace or pressure. I was sort of forced to put wedding videos on hold when about two years back, my older son was diagnosed with autism, and in most ways he had become really unresponsive to those around him. We found that travel really centered him, and even lead to big surges in his learning. Because of this, travel became a large part of our lives, and I, of course, documented this. (See their Stockholm video HERE!) I was pretty astonished at the generous response our family travel videos received, and decided to build a business out of what our family loved most—travel, video, and quality time together. Since then, I’ve been creating branded video content for brands that align with our lifestyle. Easily, the hardest part about being an entrepreneur is the potential for rejection, and that when rejection comes, it falls entirely on you, as the owner AND creator. I feel like this isn’t something even business owners and creatives talk about with one another, because there is a lot of pressure to look like things are flowing and evolving perfectly with your brand, but owning your own business means pitching, and pitching means potential rejections as well as potential successes, and it all balances out in the long-run, but it can be difficult to not let one or two rejections derail your vision. For me, the best part of being an entrepreneur is managing your own schedule. As a mom, and a business owner, I try really hard to be present in both facets of my life, and while this is still a work in progress, the fact that I can manage my schedule to arrange to be fully in mom-world during the holiday months, and fully in work-mode during the hours of the day my kid is at school, is a privilege and luxury that doesn’t go unnoticed by me. It might sound counterintuitive, but my best ideas come to me when I’m in the middle of taking a break from TRYING to grow personally or professionally. I’ve started to give myself breaks more frequently, and the way I gauge this is, if I’m not reporting to anyone else, and I don’t feel up to doing something, whether that be posting on Instagram, going for a run, making dinner, or editing a vlog, I give myself permission to not do it. It sounds a little crazy, and obviously doesn’t always work, if there is anything that just absolutely needs to be done, but it’s just my way of exercising grace in my own life. I tend to be really hard on myself, and on my work, and ironically, this does nothing to motivate me and if anything really starves my creativity. I try to say to myself, it’s ok that you don’t feel particularly motivated, fulfilled, creatively “full” or proficient, take a break, and soon, you will. Well, not to sound like a broken record, but back to the having two kids! This means, two dinners, two diapers, two pjs, two stories, and (at least) two times coaxing them to go to sleep. By the time I’m done with that, I try to squeeze in a few moments with my husband, and keep my eyes open long enough to finish dinner. Needless to say, nighttime routines around here aren’t the most lavish occasions, but just getting time to decompress and bounce ideas back and forth with my husband, who is also a filmmaker (for Vox.com) helps me to close the day out in a way I still feel is very special. When I am coming off a really stressful week, or day, I will skip the kids bedtime entirely (leaving it to my husband), shut my bedroom door, and find the most brainless movie to 100% zone out to. I’ve always struggled with giving prescriptive advice, because I feel like each of our experiences are so different. But the lesson I’ve learned over and over and over again, is that if you put in the time and deliver your best work, more work will come. Because as entrepreneurs, we create our own pipelines of work, it is easy to panic when we’re entering what was last year’s busy season with nothing lined up, but every. single. time. the work comes as long as I've have laid a foundation through networking, creating my best content, and delivering. I am currently reading a book called “Come As You Are”, it’s all about female sexuality, and learning vocabulary to communicate, understand, and exercise your own sexuality fully. It’s not the most “dinner table” friendly conversation topic, but the content is fascinating and has really shaped the way I view myself, and how I will continue to talk about this ever important and universally complex subject, and hopefully someday it will be the perfect dinner table conversation. Also, I’ve always really struggled to stay upbeat in the winters, so a few years ago I began listening to the full Harry Potter series on audio as the days get shorter. Guys, if you have a hard time with the gloominess of winter, welcoming in a little potter into your lives is a total game changer. Limiting this to five items is going to be difficult, but I’ll try my best. First, I hope in the somewhat near future to take my family on a camper van journey through the national parks of Canada. I have an unhealthy obsession with meeting Ellen Degeneres, so I’d be lying to not add that to this list…during my pregnancy when I was super, super sick, my husband had to cut me off of “ellen tube” because it would make me so emotional. I would really love to attend a creative retreat, or maybe even plan and execute one? Either way, I hope to find myself out in nature, exploring all things creative, with a bunch of strong women sometime in the next few years. I always try enter each year with trying something that scares me, last year it was rock climbing, the year before it was hip hop dancing (total fail, lol), but this year I’m hoping to tackle underwater filming. Lastly, every single year I try to make it to Maine during the fall and never seem to make it happen, so to cross that off of my list would be really, really nice. Thank you so much for sharing, Isabel!! Be sure to follow Isabel on Instagram and connect with her Youtube!